Looks like another worthy compilation CD release of guitarist / vocalist John Du Cann's pre-Atomic Rooster band - Andromeda. This is the fifth title I've seen as such and I wanted to mention the other four discs - the ' Definitive Collection' 2-CD and ' Originals' which both are on Angel Air Records as well. But there are two others that are often harder to find than hen's teeth - ' Anthology 1966-1969' and ' BBC Top Gear Sessions 1967 / Middle Earth Club 1968' - which were both put out on the Kissing Spell label. You'd be amazed at just 'how' the track listing on these releases do vary. A few, obviously do get repeated, - but not that many. 'Beginnings' is a sixteen track CD that Du Cann had pulled from his own personal vault, stored away for forty years now (literally). It's also noted the re-mastering job of these songs were done by Du Cann. Cuts that I thoroughly soaked my mind into were both versions of the out-standing psychedelic "Let's All Watch The Sky Fall Down", the sedate "A Means To An End", the happening "Darkness Of Her Room", "And Now The Sun Shines" (sort of reminds me of a B-side to an Austin Power movie soundtrack), the foot-stomping "Sleep", the familiar rocker "Too Old", "Turns To Dust", "Return To Sanity" and the "When To Stop" (featuring some killer guitar and vocals). Two tracks here that I didn't recognize right off hand were the pop-like "You" and "Land Of A Dream". I also noticed that some of the tunes here that do show up on either one of those other four previously mentioned Andromeda releases - their running times are sometimes longer. 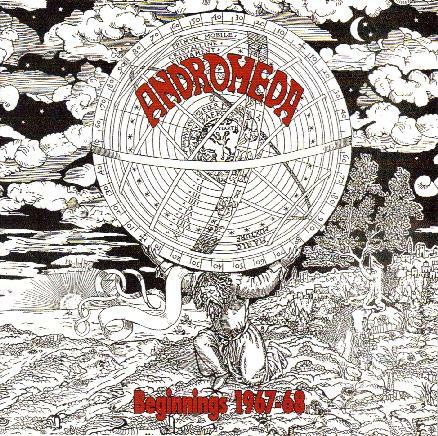 For Andromeda completists, ' Beginnings 1967-68' is a must-have but if you're checking out Andromeda for the first time, you should also get something out of this disc. Either way, Angel Air has successfully added another much desired title to their extensive catalog. Vintage psych will never truly die.